Ollie Crowfoot recently celebrated his success at becoming the youngest technician to undergo the Institute of the Motor Industry (IMI) Accreditation, at the training academy of Kawasaki Motors UK. The nationally recognised IMI Accreditation scheme enables technicians to validate their current competencies, by means of skill and knowledge-based assessments. The accreditation is considered an industry standard and instils confidence in customers, knowing the technicians working on their machines have proved their knowledge, technical abilities and have signed up to a code of conduct. There are various levels of IMI Accreditation for a wide variety of roles and for motorcycle technicians these include: Service Maintenance; Diagnostic; and Master. Successful individuals are included on the IMI Professional Register, a database of accredited technicians that can be accessed by the public and prospective employers. “For the test, basically you go in to find bikes that have faults introduced into them and you are given the tools required to find out what’s wrong with them. I really enjoyed getting hands on with the bikes. Originally I was nervous about what to do but once I got comfortable, it was like any other day of working on the bikes and finding out faults,” said Ollie, who spends most of his spare time either working on his personal project motorcycles, modifying his prized Ninja 400 or riding his mountain bike. Richard Crowfoot, Ollie’s proud father and owner of both Kawasaki Leicester and Drayton Croft Motorcycles has provided the inspiration that has encouraged Ollie to follow in his footsteps. 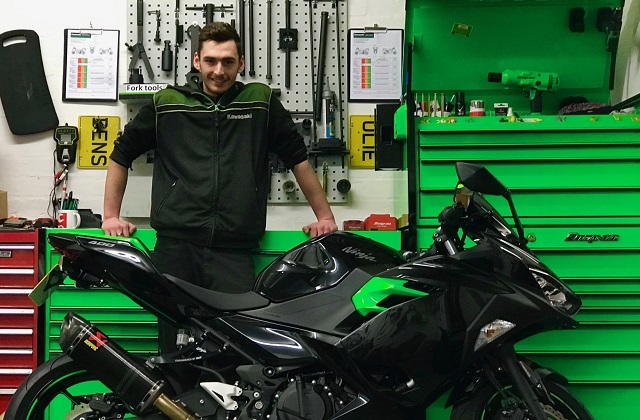 Ollie has now completed his apprenticeship and is joyfully working full time at Drayton Croft Kawasaki as a motorcycle technician.